I'm someone who is normally useless with hair, I either have my hair in a scruffy up do or I straighten it - that's as much effort as I usually put in. I would love to have gorgeous waves and curls everyday but they just drop out of my hair as it's long and thick and I normally just grab the most affordable hairspray available (that usually has a very strong granny scent!). So when Sparkle PR asked if they could send me some products of course I was up for trying the Design.ME Hold.Me Three Ways Hairspray. Design.Me Hold.Me Three Ways is the perfect hairspray for all occasions. It's a unique adjustable hairspray that gives you the option for a light, medium or high hold. Having the choice is just a lifesaver. If you're like me and you normally just go for a straight look or you just want to keep your natural waves in place, the light option is perfect. Of course there are going to be times where you want a stronger hold (especially with all the Christmas and New Years parties coming up) and you can use the same hairspray for a party look too! First off, I love the packing how cute is the baby pink!? It has a lovely soft feel to the bottle too, that makes the bottle so lovely to hold and use. The adjustable nozzle at the top is super easy to use all you need to do is switch the nozzle to your desired finish. I first tried the light hold on an everyday straight hair look. The hairspray itself is lovely and soft and has a light fragrance that isn't overpowering like many other sprays on the market! The hairspray made my hair feel soft and shiny and kept my hair straight and smooth all day long. I love that you have the lighter option, so your hair still has the natural movement in it, whilst keeping the flyaways at bay! I decided to try the medium hold when I lightly curled my hair to go wedding dress shopping. Of course on my big day I'm going to step away from the straight hair, I would love some soft curls and I wanted to see what the dresses would look like whilst I had my hair done this way. I switched to the medium hold, to keep my curls in place. Again this keeps your hair lovely and smooth, but it also helps add a bit of volume and lift to your hair which was perfect for my soft curly look. This was the perfect day to try out what this hairspray could really do, as it was pretty much stormy in the UK! My hair had to battle the wind and spitting rain whilst we found the bridal shop from the carpark! Normally I would look like a drowned rat within 2 seconds of being out in that kind of weather, but honestly my hair still had it's loose curls in. I'm so happy I used this hairspray, as I managed to try on wedding dresses with a cute hairstyle, rather than a wet frizzy look. I haven't got round to trying the high hold yet as it's more for up do's and tight curls, which is a rarity for me, but I have no doubt this would do the job. 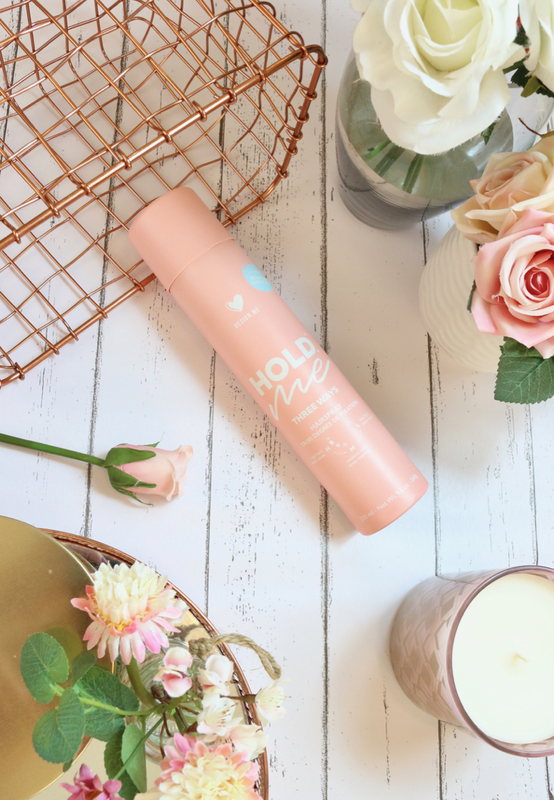 The Hold.ME Three Ways Hairspray also offers UV protection to help decrease sun damage on your gorgeous locks. I love how smooth this feels on my hair, there's not a crispy or crunchy hair in sight! I love that this has made me put more effort into my hair and create some cute curled looks and also perfect my high ponytail. This really is THE perfect all rounder for any kind of hair style and for any occasion, wether you're just wanting to tame your baby hairs or wether you're getting ready on your wedding day and needing to hold those tight curls all day long. Not to mention how cute this looks on your dressing table! I'm so impressed with the Design.ME Hold.ME Three Ways Hairspray and love that it's made me take more pride into my hair, I really want to try more products from them too. I have my eyes on the Puff.Me Volumising Powder Mist and the Fab.ME Hair Moisturising Mist. Have your tried anything from Design.ME beauties? This post contains gifted products, please see my disclaimer for more information. With less than a week left until Christmas, I wanted to share with you the little festive candle set that has seen me right through December! Recently I went shopping with Jazz and we spent over an hour in the Yankee Candle shop! (you can see this vlog on my YouTube channel). 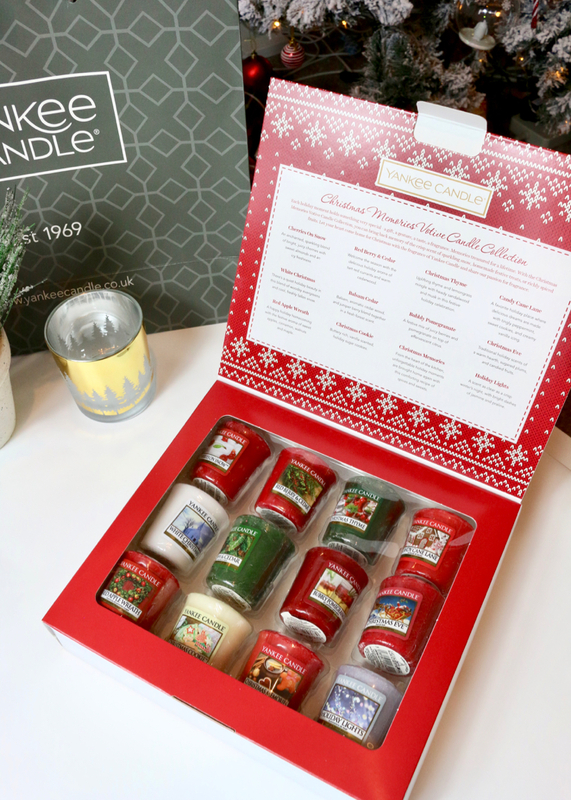 They had so many delicious Christmas scents we just couldn't make up our mind, until I found the Yankee Candle 12 Votive Christmas Memories Gift Set. We went into Yankee Candle to pick up some gifts for Christmas, as well as a little treat for ourselves. We loved this little votive gift set so much we both bought one and I bought one as a gift for someone too. This is the perfect set for the festive period as you have 12 gorgeous festive votives at such an affordable price. I managed to pick this up in the sale for around £10.50, that's just under 90p per votive! Unfortunately I can't find it on the Yankee website at the moment but I have found it on Candles Direct for under £15. Each votive lasts up to 15 hours. I like to use these 2 or 3 times for a few hours a day before switching out the fragrance. I love using votives as you get to try so many more different scents, without wasting a large candle. If you're like me and like to celebrate early, you only have a couple months where you can really utilise your Christmas scents. Getting a few votives or a gift set is the perfect way to do festive candles! This is the one Christmas set I actually adore all the scents! My favourite scents are Cherries On Snow, Red Berry Cedar, Candy Cane Lane, Bubbly Pomegranate and Christmas Thyme. If you can get your hands on this set then I'd highly recommend picking it up as all of the scents are delicious and perfect for this time of year, but not too spicy and festive that they can't be used after Christmas. What's your favourite candle scent this month beauties? If you watch my YouTube videos or you've read any of my other skincare blog posts, you'll know I definitely struggle with my skin. Ever since I've been an adult I've had the worst skin and so much acne and scarring. I've tried soooo many different brands of skincare from high street to high end and if I'm being completely and truly honest, nothing has helped. I honestly don't know why my skin is so horrendous, my diet isn't that bad - it's not perfect, but it's not as if I sit around eating pizza all day long. I always use nice skincare, I drink tons of water, I NEVER go to sleep with my makeup on and I wash my make up brushes regularly. I've honestly lost hope in ever having nice clear skin which is so sad, as I'm probably going to be worrying about my skin on my wedding day. I would love to actually go to a dermatologist, but I just can't afford that whilst planning a wedding and saving for a house! So all I can do is try out different skincare at home. My skin is probably the thing I'm most conscious about, so it's taken a lot to actually post up close and personal photos of my skin. I just think I need to actually track my skin and if any of the products I try actually work! So I think I'm going to start a new little series on my blog of before and after photo's after using new skincare products. I've always used different skincare regimes like Proactive, Liz Earle, Clinique, Origins, La Roche Posay and so many others, but honestly I've never really seen a difference. I decided to try something different and saw the Neutrogena Visibly Clear Light Therapy Acne Mask. The Neutrogena Visibly Clear Light Therapy Acne Mask uses LED light therapy used by dermatologist to treat acne. Now I don't know about the science of how this works, but I was willing to try something that dermatologists have been using for years, at home for a fraction of the price! You're supposed to wear this daily for just ten minutes and you should start seeing results after a week, but are recommended to use this for about 12 weeks to really notice a difference. The mask comes with a little activator that allows 30 uses. So once you've used all 30 uses, you have to then go and buy a new activator. Which seems a bit cheeky to me as essentially, this is just a remote to turn the lights on - but we'll get on to that later! When I first used this I was expecting to feel something, but as it is just LED lights you really don't feel a thing on your skin at all. I love that it's chemical free as you know you're not putting anything on your skin that may irritate it. I actually really enjoyed wearing this for ten minutes out of my day. I found it easy to use and easy to wear (Simon found it very amusing as it does make you look like a storm trooper!). I usually just wear this as I'm watching YouTube. You can even use this multiple times a day but I decided I would wear this once a day as suggested. Although I found the mask easy to wear and fit into my routine, I did notice the lights irritated my eyes whilst using it in the dark sometimes. I feel like they could have made more of an effort protecting your eyes, but this hasn't stopped me using this at all. I didn't notice a drastic improvement in my skin, until I actually looked at the before and after photo's! Obviously the lighting is different in these photos, but I can really tell a difference in my skin. 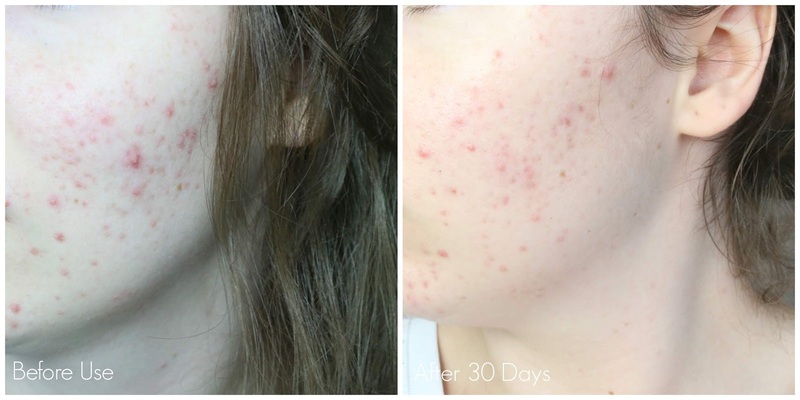 It's not a miracle worker after 30 days for me, but it really has reduced my acne and the redness! Before this post, I was going to chuck this in the pile with my tried and tested but no results products, but I'm so impressed! This mask has gave me so much hope that with continual use, I may be able to improve my skin. As much as I'm really impressed with the mask, love using it and actually kind of enjoy wearing it - I was not impressed with the thought of having to buy a £14.99 applicator every 30 days just to turn the LED lights on, on the £40 mask I already own. Since I decided actually I am going to continue to use this mask, I decided to see if there was a way to make this more affordable. I managed to find a few hacks on YouTube so you can use the original applicator whenever you want! Now I'm not a DIY kind of person, so I did get Simon to do this for me. It only took him 10-15 minutes and now my mask turns on anytime I plug the applicator in. So I highly recommended researching this if you don't feel like wasting £15 a month when you don't need to. Now I can use the mask whenever I want, I've been using this twice a day and I can't wait to see if it will improve my skin even further! Of course my skin is nowhere near clear, so I'm always open to try new products for my acne. I would love to know if you have any tips for me! 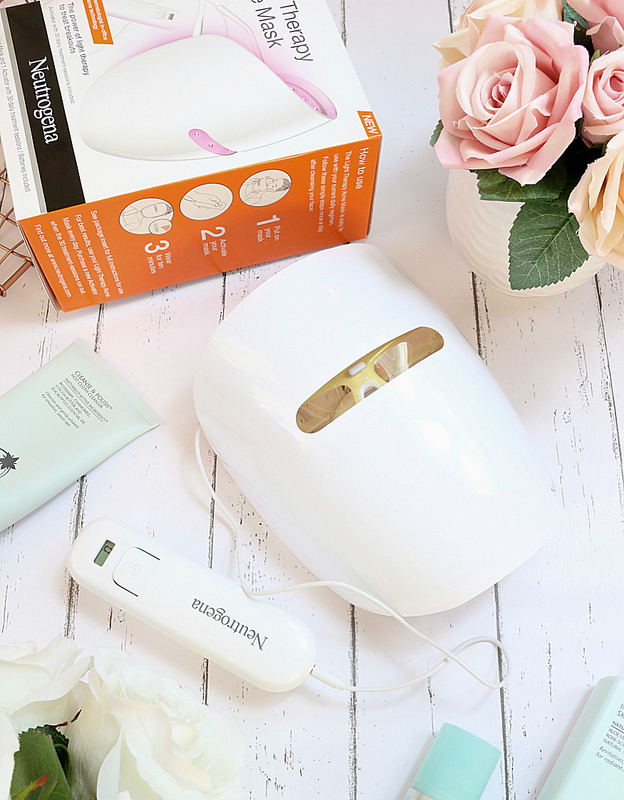 Have you tried the Neutrogena Visibly Clear Light Therapy Acne Mask Beauties?